Team Arrow must mobilise in spite of Olivers continuing absence. 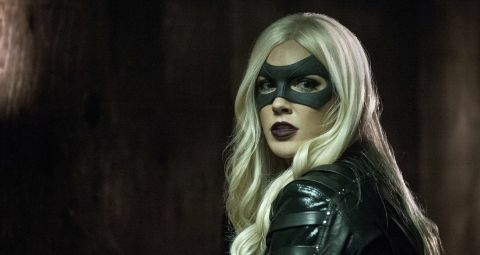 But is Laurel ready to step up to superheroine duty? Two episodes in and are we really any closer to knowing how Oliver managed to survive the mother of all mid-season cliffhangers? No, vague talk of healing herbs and lashings of penicillin tea don’t quite cut it, I’m afraid – that momentously stabby moment in “The Climb” needs to earn a weightier, more credible resolution, even if the show seems to be running scared of the blindingly obvious (okay, perhaps too blindingly obvious) Lazarus Pit explanation. So just like last week we have a storyline that keeps Oliver in the margins, allowing us another close look at the dynamics of Team Arrow. At heart “Midnight City” is an episode concerned with the collateral damage of being a hero. Laurel’s clearly struggling to fill Sara’s boots as the Canary. She’s bombarded by the realities of this whole masked justice lifestyle choice, from a hostage being shot in front of her, simply to guilt her out, to the genuinely queasy moments she has to pretend to her father that she’s her own dead sister (boy, that’s a world of awkward). The Starling City media refer to Roy’s hooded alter ego as the Red Arrow, a name his comic book counterpart used during a stint in the Justice League. Ultimately it’s Felicity who saves her from self-doubt, just as she facilitates Ray’s own impending superheroic career with the gift of a quantum processor. Felicity, you increasingly suspect, is the warp core of Team Arrow. Once again the Hong Kong flashbacks feel bitty and unsatisfying, spaced so far apart in the episode that they’re not allowed to build any true dramatic tension. They’re still not cohering as well as the island sequences in seasons one and two, though this time around there’s an effective fight in a triad-owned bar, with Oliver showing us the unexpected combat potential of a drinks tray. Elsewhere Vinnie Jones continues to geezer it up as Brick. His surprise assault on a supposedly heavily armed police station is a little ludicrous – more generously, it shows considerable balls, at least – but not half as majestically ludicrous as Vinnie Jones reciting the Bard with the words “No demands, just Shakespeare.” Let’s face it, you haven’t experienced Shakespeare until you’ve heard it in the original Vinnie. Product placement ahoy! Thea’s rather conspicuously reading a novel by Brad Meltzer, who had a six-issue run on the Green Arrow comic book in 2002/3. By a quantum coincidence Brockton Point is also a real-life Vancouver location, one that doubles for Starling City’s own Brockton Point in this episode. Now that’s the kind of coincidence that can melt universes. There’s a reference to Belle Reve, a Louisiana-based maximum security prison for superpowered malefactors in the DCU. The traditional base of the Suicide Squad, it was a regular locale in TV’s Smallville. Arrow is broadcast in the UK on Sky 1 HD.